This thread is for general discussion of climate change mitigation and adaptation technologies. ... the new technique is noteworthy because it promises to remove carbon dioxide cheaply. As recently as 2011, a panel of experts estimated that it would cost at least $600 to remove a metric ton of carbon dioxide from the atmosphere. Not a silver bullet, then, but a useful step forward. I read another article (can't find it now) on this process. It said that the cost for carbon removal was based on using non-carbon generating power....they are using hydro in british columbia...I think that not only is the power there non-carbon generating but it is also very cheap. So, if what I remember reading is correct then if running the process on non-carbon generating power gives a cost (for example) of $100 per ton then if they instead used a carbon emitting source of power that emitted a half ton of carbon in powering the process then it would effectively be only removing half a ton....when in effect doubles the cost. Anyway, its good to see that there is advancement on this. I think that it will almost assuredly always be cheaper to avoid emitting carbon than it will be to remove it from the air. Interesting. The other day I went to a local Chinese restaurant to celebrate my birthday and I got into a conversation with two other tables (only four customers in restaurant) and one man was talking about the new business he is going to start up. I dont remember the technical name, but he is going to take air into a refrigerated box contraption and the gases naturally settle into different layers, then he pumps out CO2, O2, Argon, Nitrogen, and sells them. He plans on hiring workers that are recovering drug addicts. I wish I had thought to ask about his power source. In this area I have seen some farmers and small industry use wind power. This thread is for general discussion of adaptation to climate change. “The process of adjustment to actual or expected climate and its effects. Adaptation needs to refer to circumstances requiring information, resources, and action to ensure safety of populations and security of assets in response to climate impacts. Adaptation options are the array of strategies and measures available and appropriate to address needs. China’s recently announced changes to national solar policies will bring significant impacts for the global PV market and possibly the first contraction in global PV demand since before 2000, according to GTM Research. ... This week, Chinese solar firms sent a letter to their government urging it to delay the new policies, saying they faced huge debts and needed a few more years of subsidies to be more competitive. This is about creating a sober, realistic picture of the nature of the challenge of climate mitigation. There is a understandable tenancy among advocates of 'urgent action' to use narratives such as (in a more extreme form) "we can do it now with current technologies ... if only we have the will". Some of us see that as an unlikely path to progress. The models that take us to a world where global warming is limited to 2°C, are much too optimistic, according to Glen Peters at CICERO. CICERO is Norway’s foremost institute for interdisciplinary climate research. - But only in the models. Many model's assume negative CO2 emissions. That means technologies that remove CO2 from the air. Although not stated in the video -- getting to a zero-carbon electrical grid only eliminates some of the emissions. Zero-carbon electrical energy is considered the "low hanging fruit" and a stepping stone for further progress. For example, replacing electricity for fossil fuels in a number of applications in industry, at home, and in some modes of transportation. The data above, which comes from the International Energy Agency (historical) and PwC (future), comes as a surprise to many people. 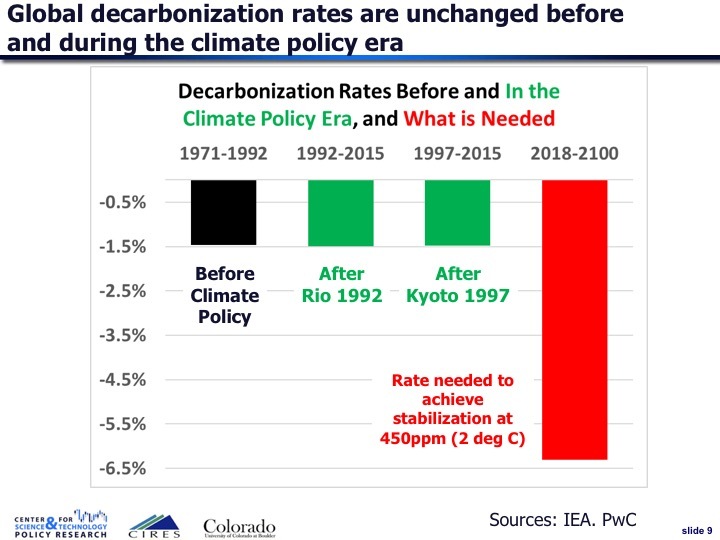 It shows that decarbonization rates have not changed from before the climate policy era (1971-1992: 1971 is the start of the IEA dataset and 1992 is the year of the Rio Convention) to after it began (measured as after Rio 1992 or after Kyoto 1997). ... Each nation has its own story, which can be spun as more or less successful. But if we are being honest with ourselves, none is remotely close to what is needed according to the targets that these countries have putatively agreed to meet. ... Hansen provided what’s considered the first warning to a mass audience about global warming when, in 1988, he told a US congressional hearing he could declare “with 99% confidence” that a recent sharp rise in temperatures was a result of human activity. ... former [US] president [Barack Obama] “failed miserably” on climate change and oversaw policies that were “late, ineffectual and partisan”. Closing thought: There are so many ways and directions in which one can plausibly point fingers of blame. That realization gives me some self insights and makes it a bit easier to back off from my own attachments. Especially to partisan explanations. Dukkha really is the common background of human existence -- no matter what your political ideology, favorite party, etc. I call on Buddhists to assume that applies doubly to "engaged social/political Buddhism". Two good posts, Leeuwenhoek - thanks. The path to a liveable world is steeper every month we delay the big policy changes which are needed. And for me, the crux is policy, which always comes back to political willpower - there just isn't enough of it yet! Better technology would help,of course, but I think we can do it with existing technology - if we really start putting it out there - and we don't need to wait for a silver bullet. Can't afford to wait, anyway. Carbon taxes would accelerate the transition away from fossil fuels and towards renewables. So would bans on further exploration for fossil fuels - it's absolutely nutty to issue exploration permits for resources which we know will have to stay in the ground. Divestment programmes are already having good results but we could do with more action there, too. Market Forces - https://www.marketforces.org.au/about-us/ - is the one I know but I'm sure there are others internationally. A report released by the Solar Energy Industries Association on Tuesday revealed that 55 percent of all U.S. electricity generating capacity installed in the first quarter of 2018 was solar. A whopping 2.5 gigawatts of solar was added, marking the 10th straight quarter where more than 2 gigawatts of capacity added. The report also noted that total installed capacity could double in the next five years. No matter how fast we move towards renewables this statement will be true. Indeed. We actually need to reverse carbon emissions - start taking CO2 out of the air - to get back to the climate we had 50 years ago. But every reduction in emissions helps, and IMO we need to celebrate it (within reason) to maintain our motivation by reassuring ourselves that we can still make a difference. As I've said before, it is never too late to make things less bad. There are some ironies here but it is mainly a very good-news story about renewables replacing coal. We shouldn't "trick ... the public to accept the fantasy of 100 percent renewables"
... Young people are puzzled that, 25 years ago, President Clinton terminated R&D on next-generation safe nuclear power, the principal alternative to fossil fuel electricity. It is not too late. My advice to young people is to cast off the old politics and fight for their future on technological, political, and legal fronts. Young people and old people must understand the implications of the accompanying graph. The fight to phase down fossil fuel emissions is not yet being won. James Hansen, retired director of the NASA Goddard Institute for Space Studies, directs the Climate Science, Awareness and Solutions program in the Earth Institute at Columbia University. Comment: A engaged Buddhism on climate changes needs to recognize a diversity of opinions on what constitutes a skillful response. The phrase "A Buddhist response ..." should be explained as one of several possible responses. Better yet, we should speak of 'Buddhist responses' (plural) or 'responses consistent with Buddhism'. As long as fossil fuels are cheap, they will be burned and emissions will be high. Fossil fuel use will decline only if the price is made to include costs of pollution and climate change to society. The simplest and most effective way to do this is by collecting a rising carbon fee from fossil fuel companies at domestic mines and ports of entry. 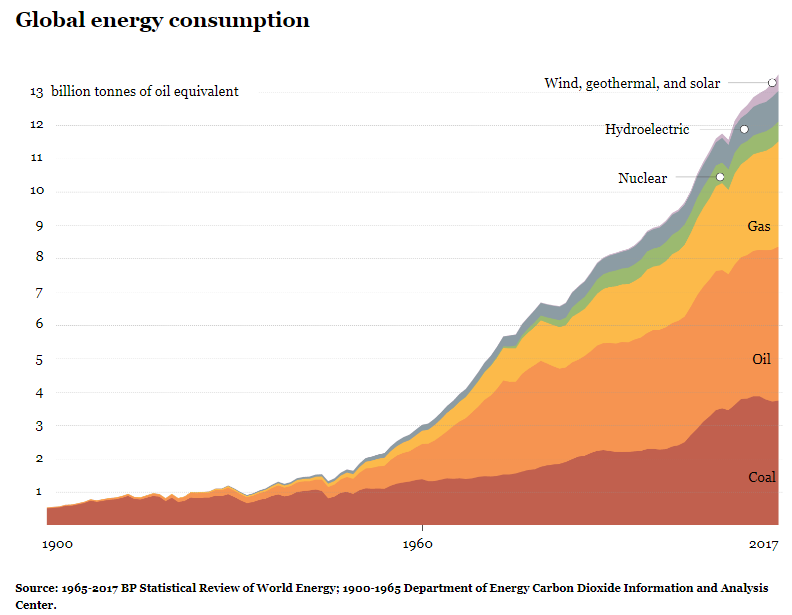 That is, Hansen's primary concern is to drag down fossil fuel consumption, not to promote nuclear. Yes, he does call "next-generation safe nuclear power" the "principal alternative to fossil fuel electricity," (emphasis added) but that's all he says about nuclear power in this op-ed. Personally, I think he's over-optimistic about nuclear and under-optimistic about renewables. I also think that he takes for granted a consumption-driven economic model which is totally incompatible with a sustainable society. But those are my opinions and I acknowledge them as such. Last edited by Dorje Shedrub on Mon Jul 02, 2018 2:41 am, edited 1 time in total. 2016. The idea that renewable energy can power the UK is an “appalling delusion”, according to the final interview given by former chief scientific adviser, the late Professor Sir David MacKay. The sensible energy and climate change plan for the UK, MacKay said, was for the country to focus on nuclear power and carbon capture storage technology, which traps the carbon dioxide from fossil fuel burning. In that scenario, the amount of wind and solar the UK needed would be almost zero, he said. However, solar could be a very important power source in other countries, he said, where sunny summers coincided with a big demand for electricity for air conditioning. Prof MacKay also said electric cars are going to be a “massive hit” but said he was “very disappointed” by the lack of progress on CCS, after the government cancelled a pioneering £1bn programme at the last minute. Prof MacKay was a physicist at the University of Cambridge and served as chief scientific adviser to the Department of Energy and Climate Change (Decc) from 2009-2014. He had gained public prominence after writing a book, Sustainable Energy - without the Hot Air, which assessed the potential of energy technologies from physical principles. Last edited by Dorje Shedrub on Mon Jul 02, 2018 2:43 am, edited 1 time in total. 4th Generation nuclear power systems are impressively much more safe than the current 3rd generation designs but it can re-cycle nuclear waste from other power plants. The re-cycling feature, so-called "breeder reactors", is a technology that the US was preparing to rolled out 30 years years ago before the program was delayed and then finally canceled. There is also a international organization of nations working on different joint designs for 4th generation reactors. Australia is the most recent full member. Bill Gates' nuclear firm TerraPower and the China National Nuclear Corporation have signed an agreement to develop a world-first nuclear reactor, using other nuclear reactors' waste. ... Fourth generation Travelling Wave Reactors would differ from third generation, more traditional light water nuclear reactors, as they would not require enriched uranium to generate energy, and could instead use waste uranium. Travelling Wave Reactors would require less fuel per kilowatt-hour of electricity than light-water reactors, due to TWRs higher fuel burn, energy density, and thermal efficiency. ... They could also recycle their own fuel, with only 20 to 35 per cent of the fuel rendered unusable by the fission process. I really think this is all more complicated than it needs to be, but it does show that we're nowhere near the limits of solar+storage ideas. Imagine a house where all the electricity is generated by rooftop solar. Now imagine that, in addition, the stove, hot water and heating systems are all powered by the leftover energy. It sounds like an emission-free pipedream, but the technology may be one step closer with the launch of a $3.3 million pilot project in Perth's south. Canadian gas giant ATCO is building a micro-grid at its Jandakot base, which will convert solar power into hydrogen fuel. The micro-grid will use 1,100 solar panels to produce electricity, which will either power ATCO's buildings or be diverted into battery storage. Any leftover electricity will be used to power an electrolyser, which splits oxygen from hydrogen using water and an electric charge. The oxygen is released, while the so-called "green" hydrogen is captured and stored. The micro-grid will then store the hydrogen in two ways — using a fuel cell or injecting it into the reticulated natural gas network, to create a "greener", lower-carbon fuel. Blended natural gas and hydrogen fuels are already used in other countries and ATCO plans to test different blends at its operations. Go to http://www.abc.net.au/news/2018-07-03/r ... gh/9934862 to see the animated graphic of how it all fits together, and get a few more facts and figures. This is really nothing new AT ALL! I've been talking about it on line for a few years now. THe use of hydrogen is the guaranteed proof positive that storage of power from renewables in the form of hydrogen gas can (if it is even needed) provide all the storage necessary...period.